H Louise (Doe) Sackett, second wife of Edward Sackett (1806-1866), gave Sackett Hall to the Tappan Presbyterian Association. Edward Sacket was for a number of years associated with his brother, George A. Sackett, in conducting a mercantile business, first at Sacketts Harbor, and then at Chicago. Later in life he became engaged in the raising of cranberries on an extensive scale, marketing as many as eleven thousand barrels from a single crop. He is said to have introduced cranberry culture in the west and one of his sons is still engaged in it in 1899. "Historical Newspapers, Birth, Marriage, & Death Announcements, 1851–2003", digital image, Ancestry.com, Chicago Daily Tribune, 28 March 1892, "Mrs. H.L.D. Sackett. / Ann Arbor, Mich., March 27.—[Special.]—Mrs. H. Louise D. Sackett died in this city this evening of paralysis. 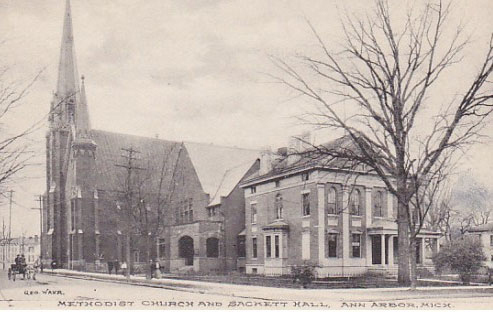 She gave Sackett Hall and the site on which McMillan Hall stands to the Tappan Presbyterian Association, and recently gave a $4,000 organ to the Presbyterian Church. She gave during her life fully $50,000 in benefactions."